Silk is a beautiful, lustrous fabric, but silk wedding dress cleaning is more difficult than cleaning synthetic fabric gowns. Silk weaves can vary from a nearly transparent organza to a heavier opaque finish such as Bridal Satin. But all silk fabric is woven from a thin, strong silk thread. Silk is naturally very soft and drapes fluidly. Many silk fabrics are very lightweight such as the fabric that common silk blouses are made of (generally called China Silk.) 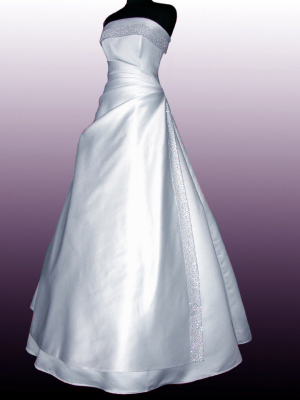 Many silk wedding dresses are also made of lighter weight silk. You may not realize it because the fabric manufacturers or the dress manufacturers may use the following methods to give the dress greater body. The fabric manufacturer may use sizing to give the fabric greater body. A good example of this is Duchess Satin, a crisp silk fabric weave with a satin finish. The crispness often comes from the sizing in the fabric. Silk quality is usually indicated by the measurement momme (mm). Momme is a Japanese term that indicates the weight in pounds of 100 yards of silk cloth 45 inches wide. The heavier the silk fabric, generally the more durable. Heavier silk bridal satins (not relying on sizing or fabric backing) are generally more easily cleaned and pressed and returned to their original condition. All cleaning solvents will remove some of the sizing that may be added to the silk fabric. Both dry-cleaning and wet-cleaning can affect the sizing, although less sizing is generally removed with dry-cleaning. If your wedding dress is made of a very crisp silk, created from sizing in the fabric, it is likely that after cleaning, much or all of the crispness will be gone. Many silk garment care labels state “dry-clean only.” While dry-cleaning will remove less sizing than wet-cleaning, it does not remove all types of stains. Sugar substances (i.e. spills from wine or juice) are not removed with dry-cleaning solvents and will require wet-process cleaning or thorough wet process pre-treating. Some silk gowns may state “Dry clean only” but then also have the symbol for wet process cleaning on the care label indicating the manufacturer considers wet process cleaning safe. At Heritage Garment Preservation, we have cleaned silk gowns with every solvent that is available for dry-cleaning. We have used perchloroethylene, Green Earth, and Hydro-carbon (also called DF2000.) We have also wet processed many silk gowns and have found many benefits to this method of cleaning. While we continue to research the best methods of cleaning all types of fabric, we recognize that silk fabrics require greater care and have currently determined to use virgin Green Earth (silicone based) solvent when we dry-clean a gown. Green Earth is safer for beads and sequins than perchloroethylene. We may also determine to spot clean or clean with wet process many of our customer’s silk gowns because of the benefits to that particular gown. Our goal is to return every gown as near as possible back to it’s original condition. Because of this, we may clean a gown several times, employing both dry-cleaning and wet process where necessary. This decision is determined by the fabric finish, extent and content of the stains, age and condition of the gown. Wedding gowns that we wet process and preserve are often cleaner, fresher and in better condition that those that are “tumbled” in dry-cleaning solvent. This is because our wet process wedding gown cleaning is done by hand, each gown cleaned individually, and carefully removing each stain. Our unique process helps protect delicate beads and sequins while ensuring thorough stain removal. We can lighten aged yellowed gowns when we wet clean them. Wet process cleaning leaves no chemicals that might contribute to the yellowing of white textiles. Wet process cleaning removes sugar substances, unlike dry-cleaning solvents. Perspiration is more thoroughly removed with wet process than with dry-cleaning. Perspiration left on a garment can damage the fabric as it causes the fabric to become brittle with age. There are some risks in wet process silk wedding dress cleaning. Chafing of silk satin fabrics. This is the greatest risk of wet cleaning silk satin fabrics, particularly if silk satin wedding gowns are wet cleaned in machines. The fibers in silk satin fabrics are fragile and can be damaged easily resulting in loss of sheen that resembles wrinkles. However, even after thorough pressing the sheen will not return. Consequently, we may determine to dry-clean your silk satin wedding gown. If wet cleaning is necessary, it is always done by hand and not in machines. Slight shrinkage of the silk. Usually the shrinkage is minimal and usually the fabric stretches back to its original size during pressing. Slight stretching of the silk. This is particularly notable if the fabric is very lightweight, with sizing added for body. Without the sizing the fabric tends to drape more and may give the appearance of stretching. Pressing silk is more difficult after it has been wet-processed. Wet-processing may leave the texture slightly altered, particularly in thinner silk fabrics. Silk satins may not have the same sheen after wet process cleaning. As mentioned earlier in this article, the removal of the sizing changes the weight and “feel” of the silk. More sizing may be removed with wet processing than dry-cleaning. However, removing sizing is beneficial for preservation purposes, as sizing can attract mice and insects. At Heritage Garment Preservation, we believe that the benefits of wet process cleaning often override the risks. Stains left on a garment may oxidize with time, gradually becoming darker and even more difficult to remove. If the wedding gown is ever to be worn in the future, it should be as clean as possible before preservation. If it is never worn again, and it is only preserved for sentimental reasons alone, then a clean gown will look nicer longer. Cleaning your wedding gown and returning it to as near to pre-wedding cleanliness as possible is our primary goal.Museum quality preservation is our final step, but only after we have done all possible to clean the gown thoroughly.